Disclaimer: Webelos scouting is performed with slight variations in different Councils. New leaders should check with their Cubmasters and District staff as to particulars in their unit or area. Welcome to Webelos Scouting! You have embarked on an adventure that is unique in Scouting! Boys at this age are maturing and learning to be more self sufficient. Soon they will be Boy Scouts. And it is your job to help them make this transition in a fun and adventurous way. Webelos stands for "We'll Be Loyal Scouts." The major goal of Webelos Scouting is to give the Scouts a taste of what it is like to be a Boy Scout and to get them use to how Boy Scouting is structured. As a Webelos Den Leader you will be introducing the Cub Scouts probably the most adventurous boy led organization in America today! Webelos are the oldest Cub Scouts in the Pack and as such carry the responsibility of being good role models to the younger Cub Scouts. It also falls upon the Webelos to help explain what exciting activities await the younger Cubs and to help the Cubs during Pack activities. In Tiger, Wolf and Bear dens the family unit was central to the forming of the Cub Scout and activities revolved around the family unit. The emphasis in Webelos scouting shifts from these home-centered activities to group-centered activities similar to those they will be encountering in Boy Scouts. Webelos dens in some areas are also known as patrols. The patrol is central to both Webelos Scouting and Boy Scouting. Because Webelos Scouts do most of their activities as a den, parents play a new, more supportive, and less directive role in Webelos scouting. Webelos Scouts learn that it is their responsibility to earn their activity badges. They are helped by their Webelos Den Leaders and Activity Badge Counselors (adults who volunteer to host an activity badge) and it is the Webelos Den Leaders who pass the Webelos Scout on the requirements. The boys should become involve in program planning. They will learn simple leadership skills and they will surprise you with their ideas. The Webelos should also get involved in setting a code of discipline for the group. They will learn what it is like to set rules and live by them. The den conducts some projects that can be credited towards the ranks and activity badges that the boys earn, but not all of the requirements are addressed at den meetings. This is deliberate. The Webelos Scouts learn that if they wish to advance, they are responsible for meeting the requirements outside den meeting times. These requirements are challenging, but very reachable by boys in this age group. These surmountable obstacles and steps to overcome help a boy grow in self-reliance and the ability to help others. This is patterned after the merit badge and advancement process in a Boy Scout Troop. Unlike most Cub Scouts, their den meetings are typically held on evenings or Saturdays. This is to get the Scouts use to meeting when Boy Scouts meet. Also Webelos do not follow the monthly theme of the Pack, but have their own program centered around the activity badges that are earned. Webelos Scouts also take on more responsibility for the running of their den however the actual responsibility resides with Webelos Den Leaders. This is to get the boys use to making their own decisions. When they enter Boy Scouts they will run the entire show. Adults will advise and guide. It is in Webelos that the world of outdoor Scouting begins to open up. The Webelos are able to camp and go on other outdoor activities. Most of these activities are not with the Pack, but with their den, other Webelos dens and with Boy Scout Troops. They also participate in Boy Scout Troop meetings, Camporees and other Boy Scout events. In short, Webelos Scouting is the senior level program in Cub Scouting. It is meant to help transition the boys from Cub Scouting into Boy Scouting. Webelos are under the direction of the Cubmaster, hold their own activities, and do many things too advanced for the younger boys. At the end of the Webelos program, the Scouts should have a taste for what Boy Scouting is all about and have a head start in proceeding through the Boy Scout program. Where a reference can be found in a printed guide, I placed it in parentheses at the end of the answers. A legend for reference acronyms is found at the end of this guide. Q. Are Webelos Cub Scouts or Boy Scouts? Q. When do the Scouts change to the khaki and olive uniform? Q. How do I get the belt loops on the Boy Scout (olive) belt? Q. Do we call our group of Webelos a patrol or den? Webelos Dens also have a den yell and a den flag. The den flag should be brought to each den meeting, pack meeting, and other relevant den activity. Den flags are created by the boys. Q. Do we wear the activity pins on the hat or on the shoulder ribbons? Q. The leader's guide said that I need to build a relationship with a Scout Troop. When and how do I do this? Q. 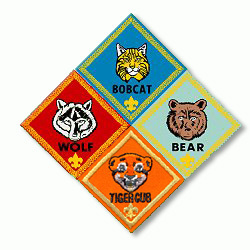 Does the Webelos Den Leader teach the boys about the activity badges? A. Yes and no. It is highly discouraged to have the Webelos Den Leader do all the teaching. In Boy Scouting (which we are trying to introduce) the boys go to Merit Badge Councilors who assist the boys in achieving their badges. It is encouraged that you get the den parents to act as Activity Badge Councilors to help the Webelos through their activity badge requirements. See the attached Webelos Den Resource Survey. However you sign the boys off. Parents no longer sign boys off indicating that they have completed requirements. (WSB, CSLB-Planning the Webelos Den Meeting). Q. Do we follow the Pack's Cub Scout monthly theme? Q. Is there a certain order we should follow in covering the activity badges? Q. Should we try to achieve all twenty activity badges? A. The program is not designed for the boys to normally earn all twenty activity badges. The reason for the twenty badges is so that there will be enough to keep the very active boy from getting bored. Remember, activity badges are not the reason for Webelos scouting. Lord Baden-Powell (the founder of scouting) said that awards and badges should be like a tan, something you achieve effortlessly, while having fun in the outdoors. Q. When is the earliest the Webelos can become Boy Scouts? Q. When is it recommended that the Webelos become Boy Scouts? A. A Webelos Scout is eligible to join a Boy Scout troop when he completes all the requirements for the Arrow of Light Award. Most Webelos who are graduating the 5th grade and going into the 6th want to be Boy Scouts and should move over, if eligible sometime after February. This gives the boys time to familiarize themselves with their new troop before the summer recess and summer camp. Q. If the Scouts will bridge in March, why do the program guides show a two year program? Q. Can the Scouts continue to earn activity badges after they bridge into Boy Scouts? A. No, activity badges are for Cub Scouts. As Boy Scouts, they will be very busy earning their First Class Rank during their first year, and earning merit badges. Q. When can the Webelos use the Boy Scout salute, handshake and oath? A. In the process of earning their Webelos badge, the Scouts learn the Boy Scout salute, handshake and oath. At your discretion, they can start to use these instead of the Cub Scout equivalents. A. Go to Round Table. At Round Table you will meet Webelos Leaders and Scoutmasters who will help you establish a fun and adventurous program. Also get trained. Not only will you obtain formal information, but you will also network with other Webelos Leaders who will act as resources. If you have already attended Cub Leader Basic, review the Webelos section of the Fast Start Tape (available from the Pack Library) and attend Webelos Overnight training.